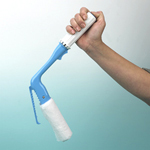 The Bottom Buddy is a handy toilet tissue aid that extends the reach of persons who have difficulty using the bathroom. 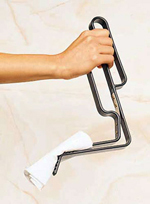 The soft, flexible head of this bathroom aid grips any tissue or pre-moistened wipe securely and releases the paper with the push of the button on the easy to use handle. Comfortable and effective, this toilet aid is a simple solution to achieving personal cleanliness. Convenient for travel. Storage bag included. This personal hygiene toiletry aid measures 11 in long and weighs 4 ounces. Use with No Rinse Peri-Wash for added personal hygiene.